For timeless looks that are always in vogue, choose cream Vertical blinds. Classic cream blinds will continue to look great no matter how many times you update your décor. Vertical blinds can be made to fit large or unusual shaped windows, including sloping styles. We’ll accurately measure up and return to fit your Vertical blinds at no extra cost. Our Vertical blinds can be made to fit awkward shaped windows and are available in moisture-resistant, anti-glare and blackout options. So many fabrics to choose from. We’ll bring them all for you to browse during your in-home appointment. Cream blinds have a timeless appeal and promise to blend beautifully with almost any décor. A stylish and contemporary alternative to old fashioned net curtains, our cream Verticals provide the perfect balance of sunlight and privacy. That makes them ideal for windows that face a busy street or are overlooked by neighbours. Whether you’re looking for versatility or elegance, cream Vertical blinds are a brilliant option. Book a free home appointment and your local Hillarys advisor will visit your home and show you samples of our entire Vertical Blinds range. They’ll establish what’s important to you and help you arrive at the right choice for your room. 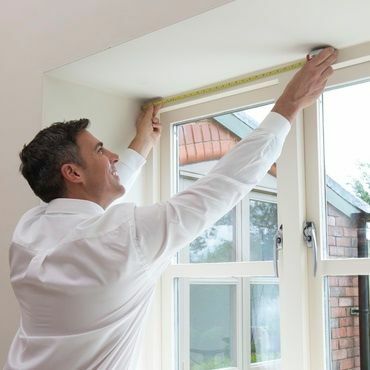 They’ll also measure your windows and provide you with a no-obligation quote to consider.